US President Donald Trump recently said North Korea had to “behave”. Let’s look at this word “behave” today. To behave means to act in a particular way. If you’re polite and follow rules, you behave well. Contrarily, if you’re rude and cause trouble, you behave badly. When someone tells you to behave, that’s because you’re not behaving well. 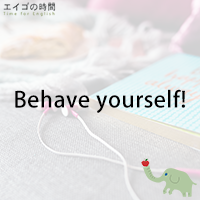 “Behave” is often used with the word “oneself” like “Behave yourself”. “Behaving yourself” means acting properly, or in the way you’re supposed to. When a child says rude things, make loud noises or run around the store, his mother should tell him to behave himself. When a teacher takes his students on a field trip, he is responsible to make sure that they behave themselves. Now. Why don’t you try a quiz? You’ll be given three options. Please listen carefully and choose the one that is TRUE. Ready?